My cycle route to Yarmouth was wild and very windy this morning as the remnants of Storm Jonas hit our shores. Head down, battling against the wind my eye was caught by a copper shape, darting about in the middle of the lane. 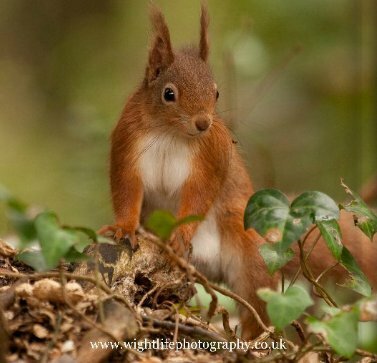 A red squirrel! 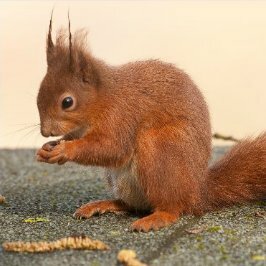 Now I must tell you that we islanders love our red squirrels. They live here in safe isolation from the dominant greys and we go to great lengths to keep it that way. Shy and secretive it is always a pleasure to come across one in the wild and to spend a while observing it. This little fellah was a beauty. Quite large, so a mature adult with delightful dark tufts on both ears and a very full fluffy tail. A very handsome and bold creature indeed. It remained unphased by several passing vehicles and continued to forage about amongst the verge and then it took off, scampering right up the middle of the lane until darting into the conifer copse. As I cycled on I reminsced about the great lengths I have gone to over the years to encourage these adorable creatures into my garden. Several metres of hazel and beech hedgerows have been planted but to no avail. I understood the principal of creating a 'wildlife corridor' to provide both shelter and food source, enticing the squirrels right to my door. It seems however that the squirrels hadn't read the same book as I, as it took many years and only a couple of sightings to appease my efforts. But I have learnt to laugh at my folly and take a sighting like this mornings as the simple gift it was. It is enough for me now to know that they live around me. When I find an acorn buried in one of my bulb pots I take comfort from the fact that they visit my garden, but not necessarily when I am about! Little wonder that with their amusing secretive ways and pretty colouring wildlife photographers go to great lengths to capture their image. Surfer friend, Paul Blackley is one such and below is one of his wonderful images.